Broken tools are not a problem if they're reported! Please report broken tools via this form. Tools break; this is not a problem - it's expected. Appropriate communication can help get replacement or repairs done promptly. Add an orange 'Broken Tool' tag[clarify] and place with the tool in the Broken Tools Box. The box is labelled and under the bench near the Radial Arm Saw in the Workshop. If the tool is fixed or nor practical to place in the box add the tag in such a way that it's obvious that the tool is broken and no attempt should be made to plug it in or use it. 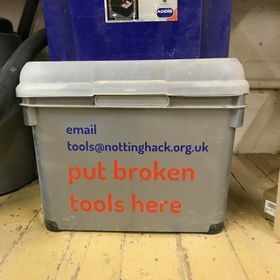 Fill in this form or send an email to tools@nottinghack.org.uk reporting the breakage. This will accelerate getting a replacement or organising repairs. This page was last modified on 27 February 2019, at 22:52.